As we approach the end of the first month of the 2019 men’s college volleyball season, teams are continuing to find their rhythm and negotiate the best lineups and plays. This week in the EIVA conference, a first-year head coach celebrated his inaugural win with his new team, a middle blocker set a new program record for blocks in a match and an upset launched one talented team into the national rankings. 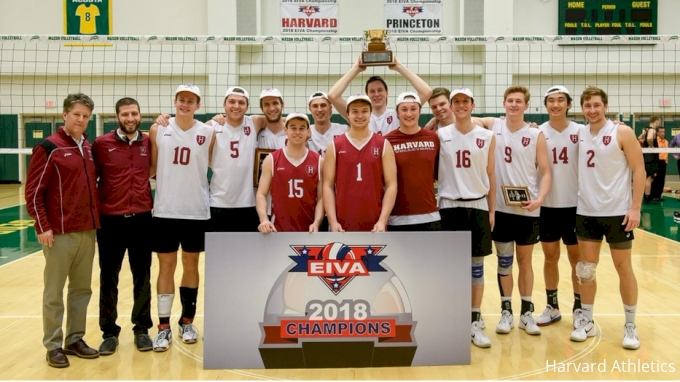 Keep reading for even more storylines and updates from the last week of EIVA men’s volleyball. With two wins and a loss last week, Charleston has evened up its record to a cool .500. In the first match of the week, the Golden Eagles dominated at the net, out-blocking Stevenson 14 to seven. Against King, serving was a strength as Charleston racked up seven aces to King’s two. In its first EIVA match of the season, Charleston managed to take a set off of George Mason but was ultimately outplayed, as Mason held the Eagles to a .172 hitting percentage thanks in large part to 13 blocks. Notable Performances: In three matches last week, three different hitters took the lead. Sophomore Maarten Bartels had 12 kills versus Stevenson, sophomore Max Senica had 19 against King and senior Brandon Greenway tallied 12 in the George Mason match. Middle blocker Adriel Roberts earned the EIVA Defensive Player of the Week honor after setting a new program record with nine blocks against Stevenson and finishing the week with 15 total blocks. Coming Up: Less than a week after hosting George Mason in Charleston, the Eagles travel to Fairfax, Virginia, to face off against the Patriots for a second time. George Mason launched itself into the AVCA top 15 with a four-set win over then-No. 11 Ohio State, which the Patriots had not defeated since 2010, and then completed a 2-0 run with a four-set victory over Charleston. Notable Performances: Hayden Wagner earned his second consecutive EIVA Offensive Player of the Week honor following a 17-kill performance versus Ohio State and a 19 kill, one error, .600 showing in the Charleston match. Coming Up: Mason will play Charleston for a second time on Friday. Did not compete last week. Coming Up: On Thursday, Harvard looks for its first win of the season as it takes on EIVA opponent Sacred Heart. Aggressive serving led NJIT to a dominant sweep of DIII Lehman, with the Highlanders collecting 19 aces by the time the match was over. In the team’s second sweep of the week, NJIT hit .364 versus DIII opponent Rutgers-Newark. Notable Performances: Sophomore Marcus Jackson led with 11 kills versus Lehman, while redshirt junior setter Pat Howell had 33 assists and five aces. Freshman Will Andrews led the match with six aces, in addition to nine kills, hitting .571. Junior opposite Piotr Namiotko had 11 kills against Rutgers-Newark, and graduate student middle Enrique de Diego Garcia added five on six attempts with no errors to hit .833. Coming Up: NJIT has this week off and will next take the court on Feb. 5 versus Kean. Penn State played No. 4 BYU very close on Friday, alternating sets and keeping the scored tied as late as 13-all in the fifth. While BYU’s Gabi Garcia Fernande dominated the match with 27 total kills, the Nittany Lions ran a more balanced offense, and four players tallied double-digit kills. On Monday, a very close statistical match saw Saint Francis out-hit, out-block and out-dig the Nittany Lions, but Penn State come out with a four-set win. "They don't seem to back down from anybody, and I think they've infused this current team with a lot of enthusiasm." Penn State's class of freshmen in 2019 are looking to make an impact early and often. "Today we grinded out a win where we didn't play as sharply as we would have liked,” Penn State head coach Mark Pavlik said. “With the energy and effort expended in the BYU game on Friday and then delaying this game a day, I think we didn't necessarily have the legs in this match. With that said, we found a way to win a conference match on the road with multiple contributors throughout the lineup which is a good thing." Notable Performances: Matthew McLaren led Penn State with 16 kills in 45 swings versus BYU. Jason Donorovich, Henrik Falck Lauten, and Cal Fisher also tallied double-digit kills against the Cougars, while Donorovich added six block assists and a solo block. The 6-9 redshirt junior from New York State then led the Nittany Lion offense against Saint Francis with 12 kills, hitting .588. Coming Up: This week, Penn State hosts MIVA opponents McKendree on Friday and Lindenwood on Saturday. Coming Up: Princeton will take another week off of competition before taking on UC San Diego in California on Jan. 29. The sweep of St. Joe’s Long Island gave head coach Bob Bertucci his first win at Sacred Heart. As a team, the Pioneers hit .354 with just seven hitting errors. Notable Performances: Shawn Tischler led the match with 10 kills, while Rob Chatterton had nine blocks in addition to eight kills, hitting .545. Coming Up: The Pioneers open the EIVA season against Harvard on Thursday. Saint Francis kept things close in the first set versus BYU, but the No. 4-ranked Cougars ran away in the second and third. Against Penn State, SFU finished the match the statistical leader in points, kills, blocks, hitting percentage and digs but didn’t get the W.
Notable Performances: Michael Fisher led the Red Flash offense with eight kills versus BYU, but six errors resulted in a .069 hitting percentage for the redshirt junior. Against, Penn State, Fisher once again led the way, this time collecting a match-high 24 kills, hitting .347. Coming Up: This week, Midwestern squads Lindenwood and McKendree make their way to Loretto, Pennsylvania, to take on the Red Flash.